Fruit pizza recipes can be a delicious main course, side dish or dessert. We have great suggestions for orange pizza, apple pizza, pineapple pizza and more. The beauty of a recipe for a fruit pizza is the versatility of them. A fruit pizza can take many shapes and forms and can be used in many different ways. For example, a fruit pizza can be served as a dessert, an appetizer, a breakfast pie, a brunch side dish, a main dinner dish or even as a snack. A fruit pizza can be a light, fresh slice of goodness; a gooey, sweet decadent slice of heaven; or a hearty, sweet-meets-savory slice of deliciousness. How can fruit pizza recipes be used in so many ways? Well, let's take a closer look. In season fresh fruit (or even frozen fruit such as strawberries and blueberries) make an excellent topping to a thin pizza crust, crescent roll, English muffin or flat pastry. Sauces can include cream cheese, jelly and jams, syrup or a drizzle of honey. Top your breakfast off with a luscious and creamy cappuccino for a fantastic start to the day. A fruit pizza is an excellent side dish to serve at brunch. By using a thin pizza crust or crescent roll as a base, a little jam and a fresh fruit topping such as berries, mandarin oranges or pineapple, you have a simple, yet delicious dish. Just cut up into squares and serve. 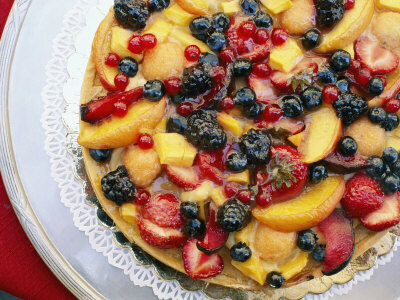 For a dessert fruit pizza, try using a sweet crust like a sugar cookie dough base or pastry crust. Place fruit, such as strawberries or bananas on the crust and drizzle a little chocolate sauce on top. See the dessert pizza recipe page for recipes. Incorporating fruit into a savory pie is a fun way to mix up a traditional pizza. Of course, we've all heard of a pineapple and ham pizza. If you're a fan of the Hawaiian pizza, then you already know what I'm talking about. The mix of sweet and savory can give an incredible flavor to your pie. How about combining orange marmalade with chorizo sausage to create an orange pizza? Or apples and chicken pizza recipes? The point is fruit should not be forgotten as a delicious topping option for a sweet or savory pizza. Most of us love pineapple and ham pizza right? Well, these recipes include pineapple, three cheeses and olives. Delicious! This recipe combines fresh, in-season fruit, a cookie dough base and preserves. It's a must try! So many things you can with apples and pizza. These apple recipes make great dessert pizza dishes. Try this awesome pizza made with strawberries! yummy! If you love cream cheese you will love this pizza. This sweet fruit pizza recipe also makes a great dessert and includes cream cheese (anything with cream cheese has to be good, right? ).